I've made a couple of "flux capacitor transmorgifiers" for my 5 year old son and his friend. 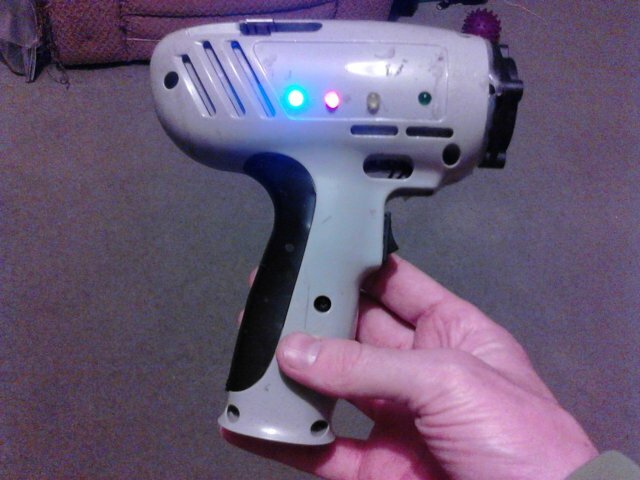 The first one was made from the shell of an old battery drill, plus a computer CPU fan glued on the front and some flashing LEDs and a 9 volt battery. Smaller 5mm flashing LEDs. Adam helped drill the holes. 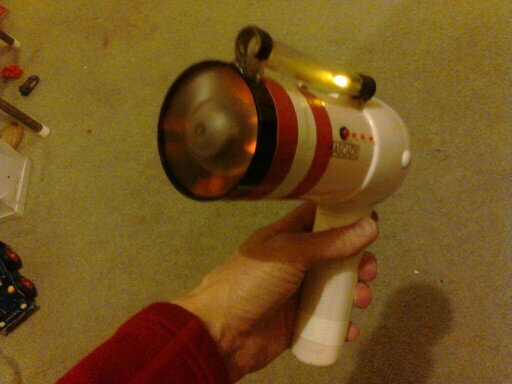 There's a 3 position switch (from another old hair dryer) which is either; off, up = Large LED's on plus fan, or down = flashing LEDs on. This took about 2 hours to build with Adam helping sometimes. The second one is made from a $1 hair dryer (bought off Trade Me). I ripped out the heating element and moved the fan to the front of the casing. Then added LED's; some small 3mm ones, some 5mm flashing ones, a bright orange LED in behind the fan. 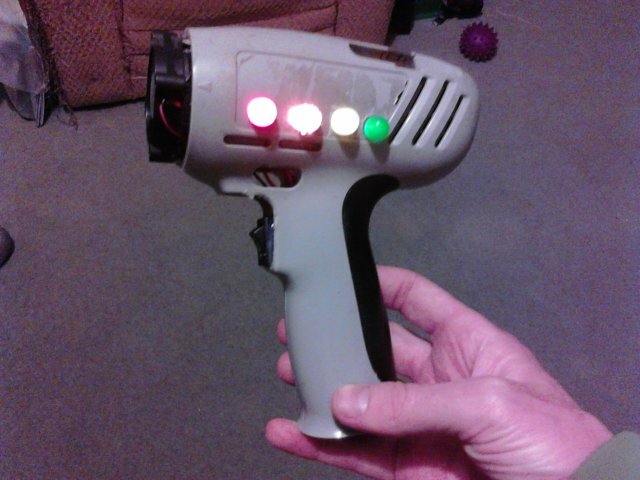 Again it uses a single 9 volt LED to power it. Michelle said it need a bit more "steam punk" so I added a yellow LED inside a plastic tube stuck on the out side. And there's a piece of video drum head stuck on the back for looks. The three position switch allows it to have two different on modes; switching two different strings of LED's with the fan. When the fan runs it is spinning such that the sharp leading edge of the fan blades is on the inside of the casing - so if you stick your fingers into the fan blades (which everyone wants to do) your fingers are pushed "out" of the fan. 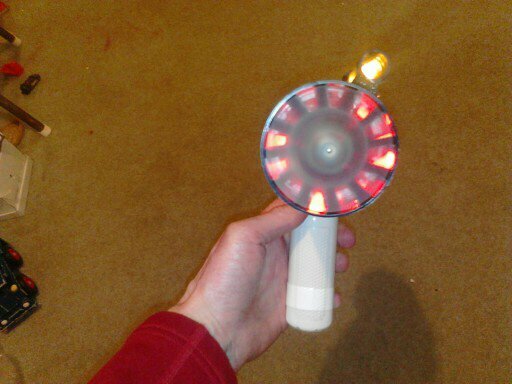 Plus it's a 12 volt fan being driven by a 9 volt battery so it has so little grunt that it's easy to just stop the fan blades spinning with your finger. All up this version took about 2 hours to build. All in all this has worked so well I'm keen to build up some more to see what else I can do to make them cool and still easy/quick to build. 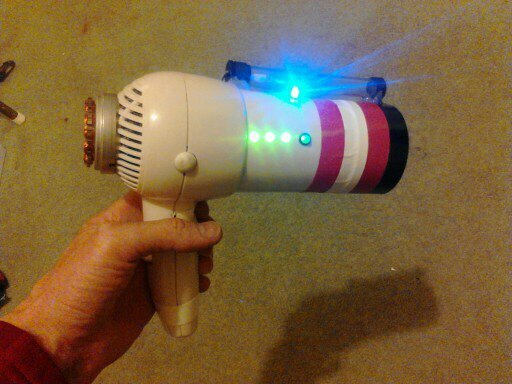 Here's how to rip apart a hair dryer so you can turn it into something else. They're designed to run off 12 volts , but the motor still works fine with a 9 volt battery, just slower and less powerful. Having it underpowered makes it less dangerous for little fingers.